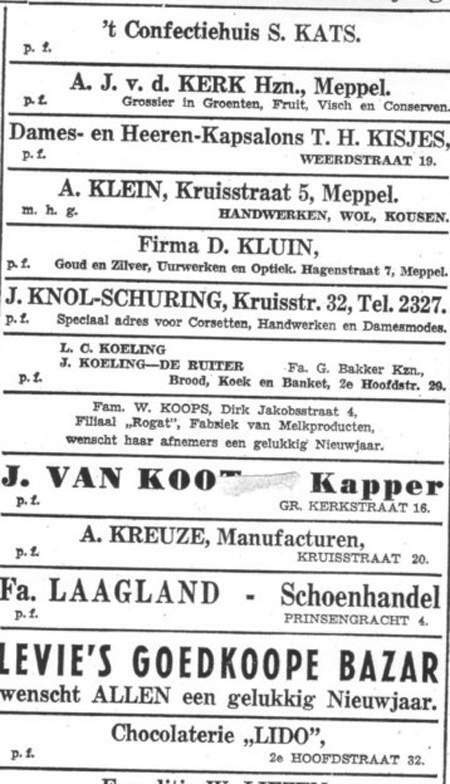 Adolf Klein had a needlework shop at 5 Kruisstraat and sold  as appears from the text on a postcard sent by him  needlework, stockings and yarns. He was a son of Jacob Klein (born at Stadskanaal in 1862) and Rosetta Frankforter (born at Beerta in 1866). They married in 1899. A year later their daughter Gholina was born; then came Adolf in 1901. He married Vroukje de Vries (born on 28 February 1903). She was one of the eight children (all born at Dwingeloo) of Benjamin de Vries (born at Dwingeloo in 1857) and Geziena Elshof (born at Smilde in 1864), who had married in 1899. In the thirties Bejamin moved with his family to Meppel, where he died in 1935. Adolf and Vroukje had no children. Vroukje’s older brother Jozef (born at Dwingeloo on 28 February 1890) came to live together with his wife Berni Löwenstein (born in Germany in 1895) above the shop of his brother in law; their address was 5a Kruisstraat. He was a merchant. Their daughter Ellen was born on 12 May 1934. Also Jozef’s sister Betje (born on 25 December 1896) came to live with them. She was a correspondent at the Amsterdamsche Bank in Meppel. 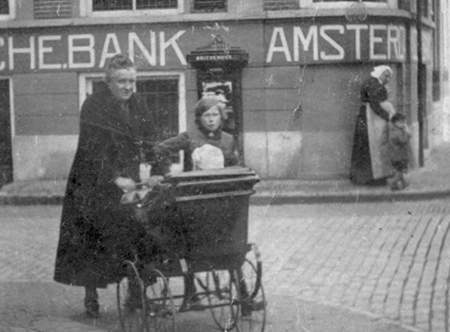 She was fired as early as 1 October 1941.
the corner of 1st Hoofdstraat and Grote Kerkstraat. Betje was informed by Mr. Paalman that the general management intended to dismiss her on 1 October. They would give her a benefit of a one month salary for every year she had worked there. It never came to this. On a small note we can read that Betje disappeared on 24 October 1942 … The reserve for 1942 could be paid back to the bank. Betje had indeed ‘disappeared’. On 5 October she had been deported to Auschwitz and she was killed there on 8 October. On 1 October 1941 she lost her job after sixteen years of devotion to this job, by an agreement of the Amsterdamsche bank and the Germans. In order to have something to do she worked as a volunteer at the Jewish primary school for some time. of Klein wishes her clients a happy new year. Little is known about the Jewish families De Vries and Klein from Meppel. This is probably due to the fact that they came to live here at a later stage. What we do know is that the Klein Family had to hand in their radio set at the beginning of the war. Before doing this, they had to declare that they had not changed it for an inferior one. Not much later Adolf will have had to close his shop, after which his stock was taken away, which was the common procedure. 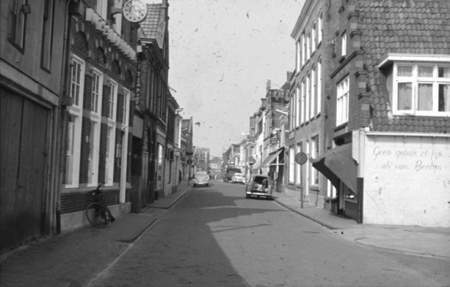 We do not know exactly when this happened, but from a letter written by police inspector Breedveld on 20 November 1942 to the National Bureau for the Distribution of Textile Goods appears that the shop was closed then. This letter was a reply to a question by Mrs. Nijeboer-Scholten, who was worried. She had ordered 500 grams of baby yarn, but had never received it because of the closure of the shop. The bureau asked the police inspector why the shop had been closed. Apparently the various departments did not have a lot of contact with each other. The next person of the family, who experienced what it was like to be a Jew in a country occupied by the Germans, was Ellen. At the end of August 1941 her parents were informed by mayor Wisman that she did not have to go to school for the time being. She had just finished the first form of primary school (Vledder School) and was keen to go to school again after the summer holidays. This was not to be. Only on 1 February 1942 she could go to school again. On 22 January her parents were informed by a letter about this. It was the Jewish school where shortly before her aunt Betje was engaged as a volunteer after her dismissal from the bank. Mrs. Wolf, head of the Jewish school had asked mayor Wisman to appoint her. Ellen was still at school when her father and her uncle were summoned to report themselves to work camp Orvelte on 20 July. 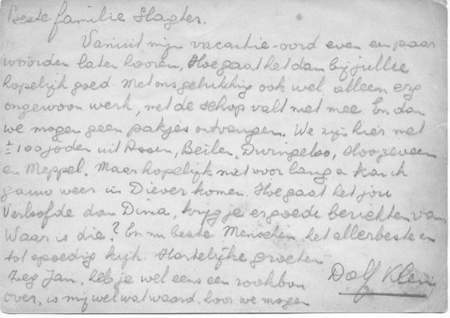 From there Adolf, who now called himself Dolf, for obvious reasons, wrote a moving postcard to the Slagter family. He probably gave it to someone to deliver it for him, for there is no address on it. From my holiday resort I send you a few words. I hope you are well. We are all right, although the digging we have to do is pretty hard work, as we are not used to it. Unfortunately, we are not allowed to receive parcels. We are here together with some 100 Jews from Assen, Beilen, Dwingeloo, Hoogeveen and Meppel. I hope to come back to Diever in the near future. How is your fiancé, Dina? Do you get good news from him? Where is he? Well folks, I wish you all the best and hope to see you soon. Best regards, Dolf Klein. Hey Jan, do you ever have a cigarette- coupon for me? It is worth a lot to me. We are not allowed to smoke here, but it happens. They have robbed us of everything. Will you think about it, please? Ellen will not have seen her father and her uncle very often after their departure from Orvelte. They will have met for a while, when they were all at camp Westerbork. This was only for a very short time, because the whole family (Betje, Ellen, Berni, Vroukje Jozef and Adolf) was transported to Auschwitz two days later. Betje, Ellen, Berni, Vroukje and Jozef were killed there on 8 October. It is not clear what happened to Adolf. It is certain that he was killed in Auschwitz on 28 February 1943.